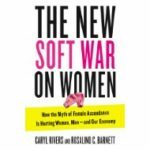 Barnett - Joelle Delbourgo Associates, Inc.
Caryl Rivers and Rosalind C. Barnett have received wide critical praise for their books about women, men, work and society. Reviewers have sing led out their ability to present sweeping and complex ideas in a lively, readable way. In 2011 they won both the Casey Medal for distinguished journalism and a special citation from the National Education Writers Association for opinion columns. Their articles have appeared in many national publications, including the New York Times Magazine, Salon, Huffington Post, Forbes.Com, Self, Working Woman, McCall’s, Ladies Home Journal, Working Woman, Dissent, Redbook, Ms. MSNBC.com, Education Week, the Nation, Mother Jones and others. Rosalind Chait Barnett’s pioneering research on workplace issues and family life in America has been sponsored by majo r federal grants. She is senior scientist at the Women’s Studies Research Center at Brandeis University. She is a 2013 recipient of the Families and Work Institutes’ Work Life legacy Award. Caryl Rivers is a nationally known author and journalist. She was awarded the Helen Thomas Lifetime Achiev ement Award in 2007 from the Society of Professional Journalists for distinguished achievement in Journalism She is professor of Journalism at Boston University. Over a lifetime of work, women with a bachelor’s degree will earn a third less (some $700,000) than a man with the same degree…Female MBAs earn $4,600 less than male MBAs in their first job out of business school. Women start behind and never catch up… Two years after graduating with the same degree as a woman, a man will be earning a whopping $9,500 more, working the same number of hours, in the same type of job, reports the National Wage Project. “Myth-shattering, disturbing, persuasive… Anyone who cares about a thriving economy – and her own career – should grab this powerful book.”–Rosabeth Moss Kanter, Harvard Business School. Same Difference: How Gender Myths Harm Our Relationships, Our Children And Our Jobs. Basic Books, August 2004. “A benchmark work”—Library Journal; “No-nonsense, refreshingly direct”—NY Times Book Review. Voted as one of the best books of the year, Boston Globe editorial board. She Works, He Works: How Two Income Families Are Happier, Healthier, and Better Off. HarperCollins, San Francisco, 1996. Based on a study of 300 couples funded by the National Institutes of Mental Health. Winner of the 1996 Books for a Better Life Award. Beyond Sugar And Spice: How Women, Grow, Learn and Thrive. Putnam, 1979. A review of the psychological literature on women. Book of the Month Club selection.